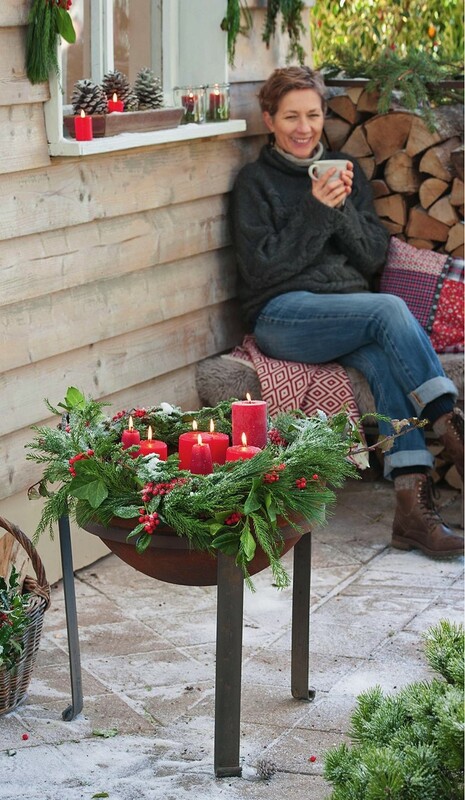 Outdoor Christmas Decor that will get you into the holiday spirit! It’s that time again. With the cold season comes the Christmas spirit. Surely you already have some ideas for your Christmas decoration. Did you also think about your outdoor area? 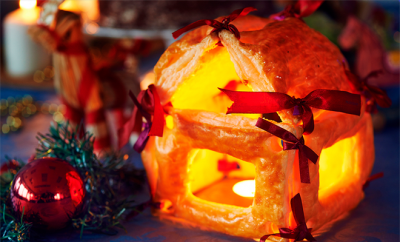 Bring your family and guests in a festive mood right at the entrance! 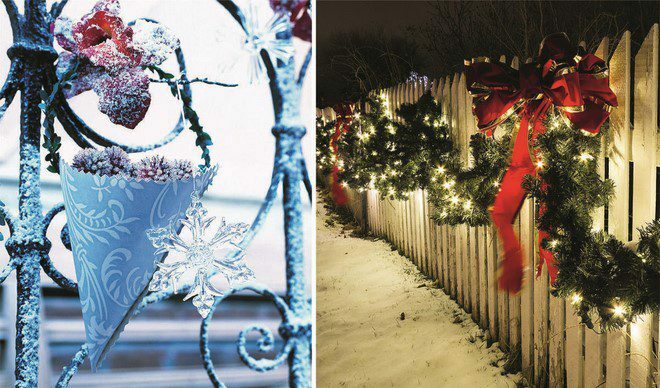 Here are a few simple ideas for your Outdoor Christmas decor. Winter in the suburbs is slightly different than in the city: the stars are brighter and more mysterious, the snow is whiter and fluffier, the nights are darker and quieter. 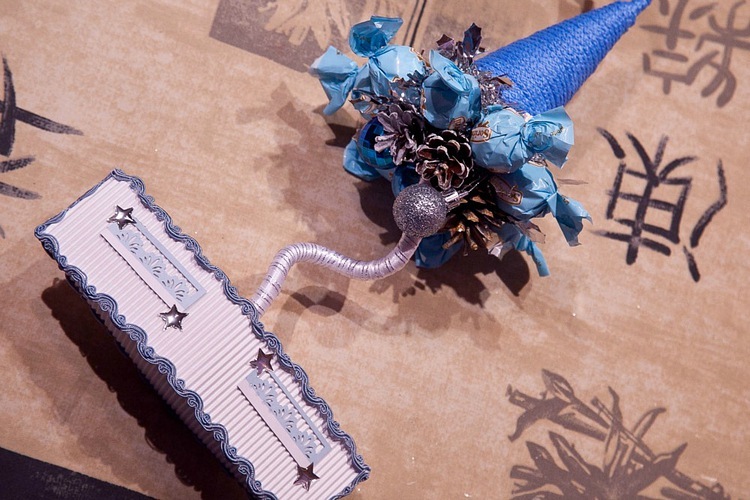 Therefore, it is easier to create an atmosphere of magic by creating a festive outdoor Christmas decor. Do not skimp on the festive lighting and decoration of the facades. Hang up LED lights emphasizing the architectural details. 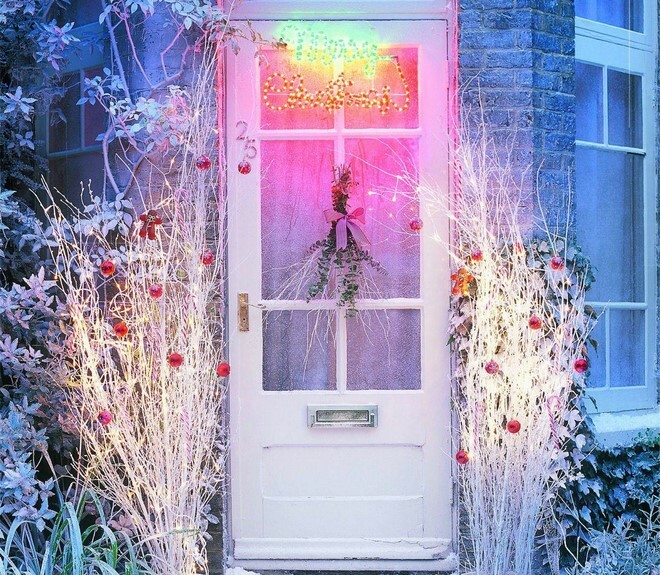 Draw light garlands, sweeping fences and wickets, light electric and wax candles to light the Christmas window displays. 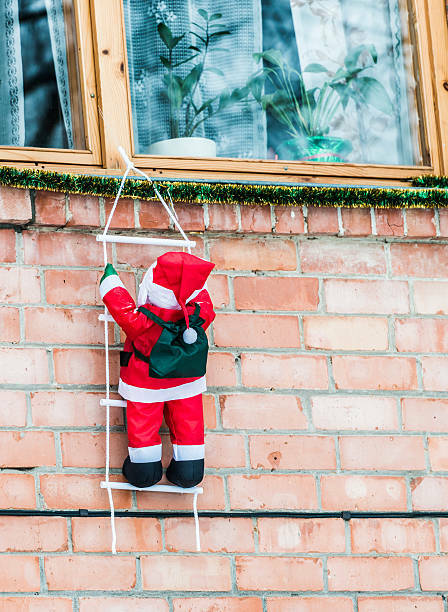 The figure of Santa Claus climbing on drainpipe with a bag of gifts on his shoulders is a great eye-catcher. Do not forget to decorate the porch. Figures of angels, colorful illumination, candle holders and lanterns will turn the usual place for garden gatherings into a fairy-tale palace. 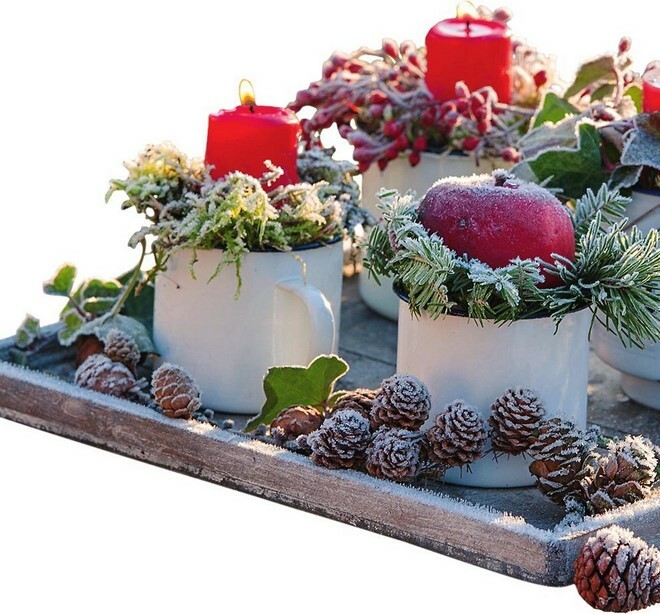 Would you like to make floral compositions of cyclamen, dry cones, birch bark and berries? Add snowmen, angels, Santa and reindeer figurines to complete the look. 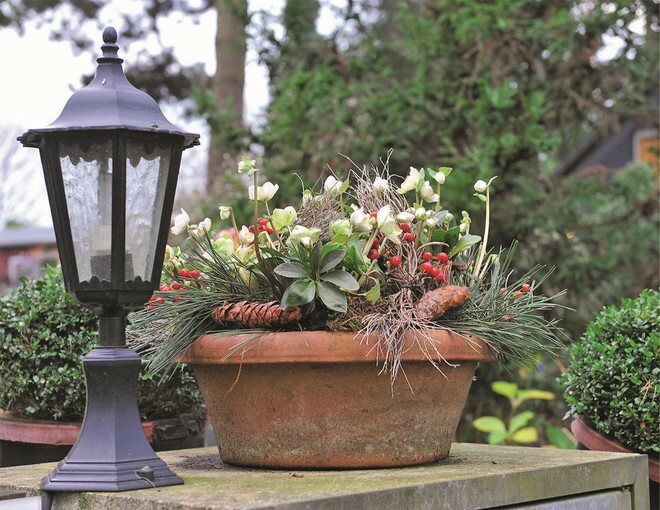 You can decorate the porch with hanging flowerpots with frost-resistant pansies, cypress, juniper, hebe. And in the spring the plants can be moved to the garden. The December garden is beautiful in itself: shrubs, powdered with snow, red berries, winding branches of willows and corkscrew hazel ‘Contorta’. It remains to make a few touches to make it truly Christmassy. 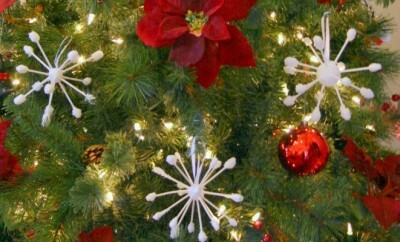 Topiary trees (conifers and evergreen shrubs) look best dressed with a thin “spider web” of white electric lights. Branches of large deciduous trees can be decorated with LED strings, which are wrapped from the bottom of the trunk and pulled along each branch, emphasizing the beautiful silhouette of the tree. If there is no time for such a painstaking job, just hang garlands of large white lanterns on the trees. And, of course, we must not forget about the living creatures in the garden – bird feeders always must be filled with delicious sunflower seeds. 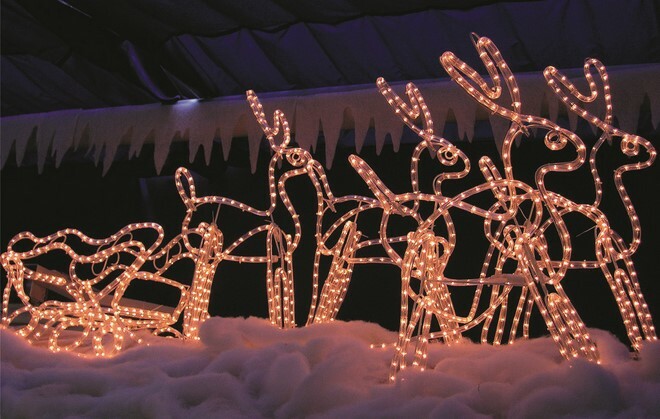 The highlight of the festive decor will be LED deer figures on a snow-covered lawn or a low tree in front of the house decorated with Christmas tree decorations. The fragrance of fir branches, the sparkling of ice crystals, bright toys and the flickering of candles – after seeing your festively decorated garden, Santa Claus will surely not mistaken the door! 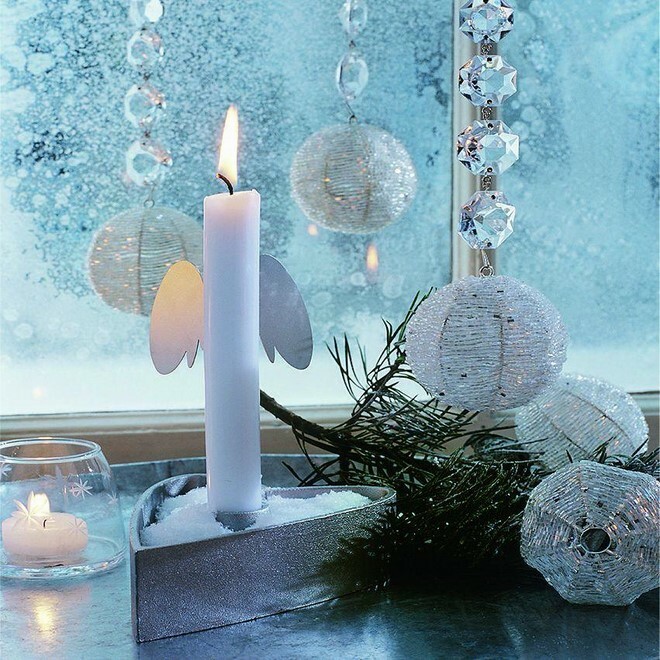 Soft light aromatic candles with the smells of vanilla, cinnamon and ginger, and flowering amaryllis and hyacinths on the windowsill. Do not forget about the Christmas star – poinsettia with bright red petals, which can be sprinkled with gold dust. The legend says that this plant brings happiness. 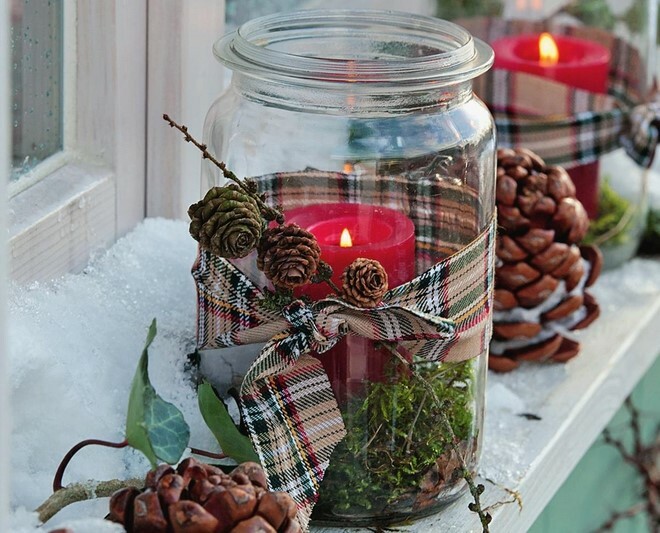 Ordinary items will turn into stylish accessories: lay moss on the bottom of large glass jars, put in red candles, tie cans with ribbons and thread sprigs of larch in them. 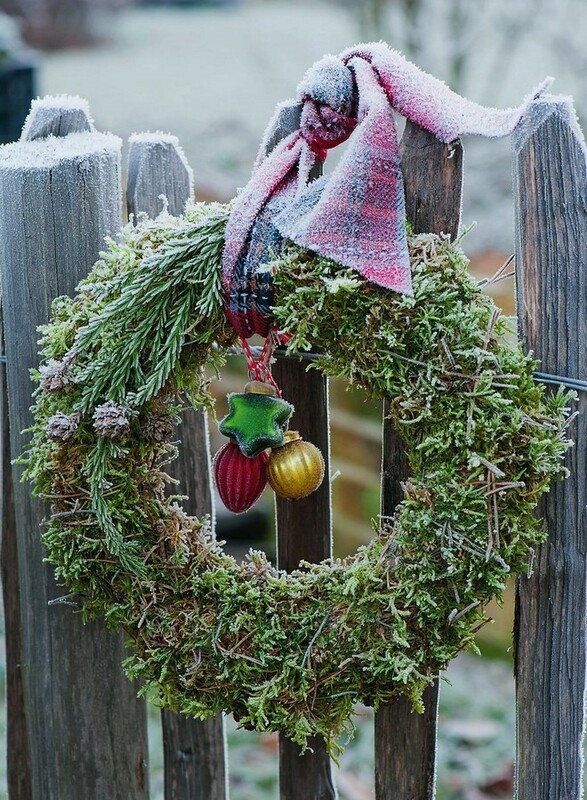 An indispensable detail of the Outdoor Christmas decor is a Christmas wreath made of sprigs of fir, holly or mistletoe and hanged on the door of the house or on the gate. Frost is a virtuoso decorator. He can cover a wreath of moss and Japanese cryptomeria branches, attached to the fence with a wide ribbon, with a lace of ice. The Christmas tree on the terrace can be decorated with natural ornaments, for example red apples, large cones and stars made of flexible birch bark. Metal mugs are useful not only for mulled wine. 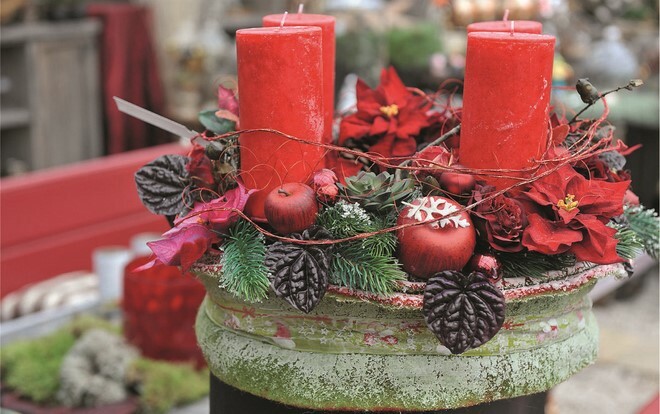 Put pillar candles in them and add apples, wrapped in a small wreath of evergreen branches, ivy or moss and you will get a nice winter arrangement. Nature provides us with wonderful gifts even in winter. 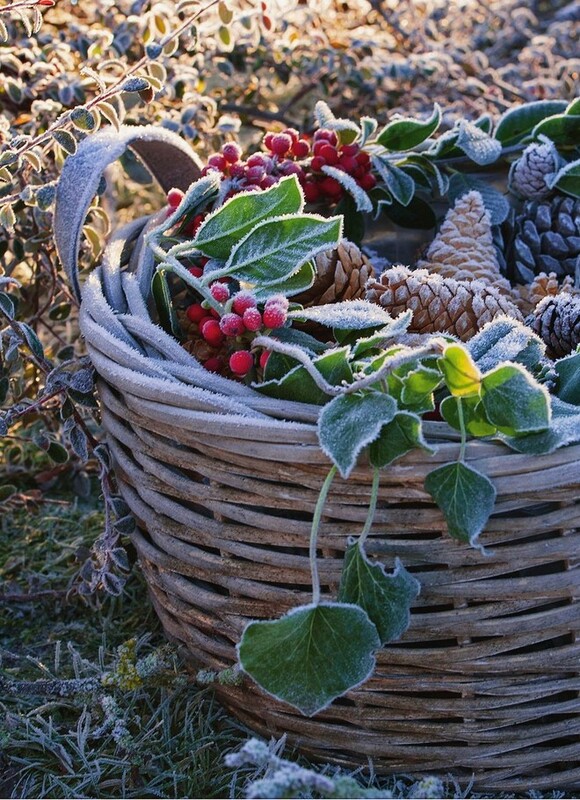 A basket filled with miraculous finds from the garden and the forest is an ideal option for winter composition, especially if a frost has worked on it. 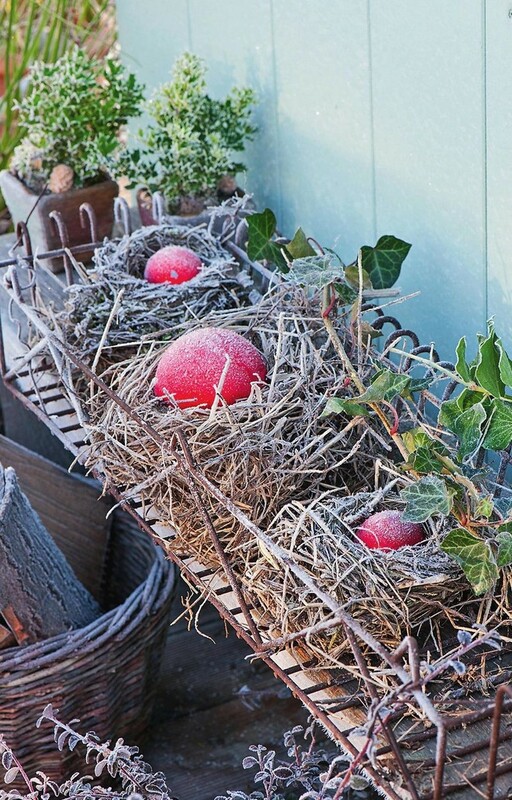 Small bird nests in the company with red Christmas ornaments or apples and green ivy leaves look very elegant. 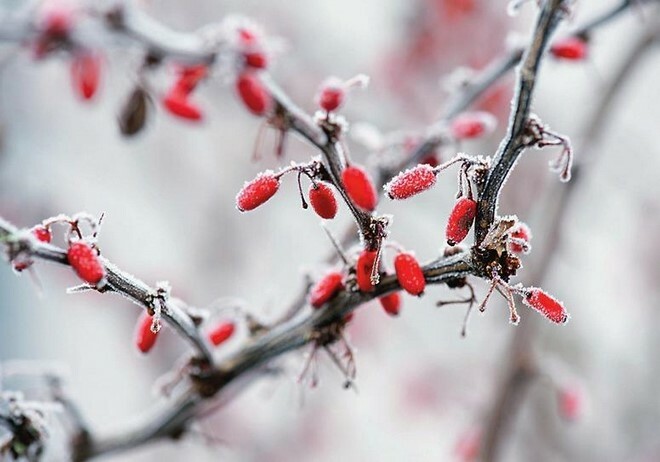 Many shrubs “put on” a festive red outfit in the winter. Even from a distance, the fruits of barberry on the bare branches are striking. A fire bowl barbecue became a stage for a festive performance. In the windless days, light the candles, set between the branches of pine, holly and ivy. 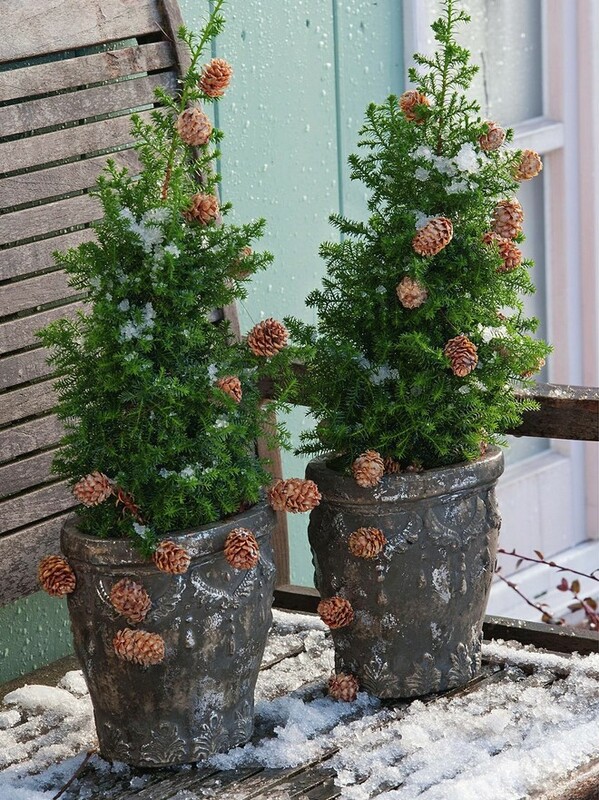 Miniature coniferous plants in tin buckets and wicker baskets can be decorated with garlands of pine cones. Attach the cones to the wire and wrap it around the plants. 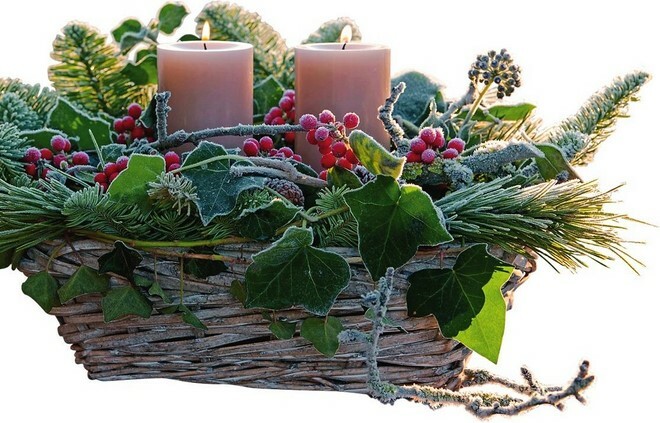 A low basket will be an ideal base for a simple composition of candles, pine needles, holly branches and ivy.